Police raid on Mombasa mosque, after raising of al-Shabab flag, leaves at least two dead and more injured. At least two persons have been killed, including a security officer, and another security officer seriously injured in clashes in the Kenyan coastal city of Mombasa after police stormed a mosque. Police raided the Musa mosque on Sunday in the Majengo district after worshippers raised al-Shabab flag and defied a police warning not to meet. Police said they raided the mosque acting on intelligence that a meeting to recruit fighters was going on. 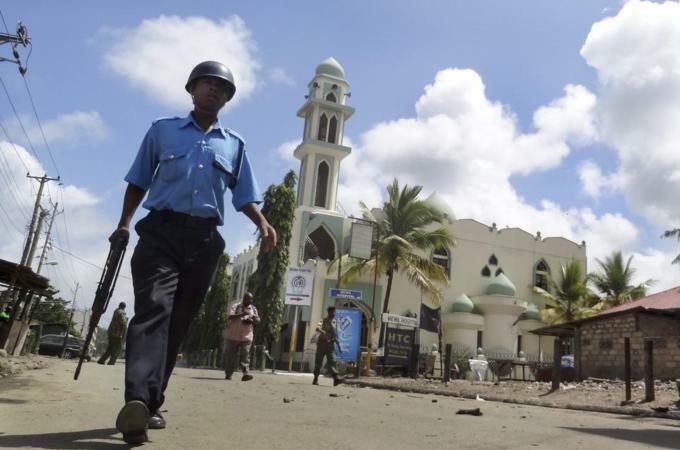 “We have arrested dozens of youths who attacked our officers while on duty at the mosque and they are under interrogation,” said Mombasa police commander Robert Kitur, according to AP. Kitur added that the officers were “on a mission to remove radical paraphernalia from the mosque when they faced resistance”. A police officer who was stabbed in the face died of his wounds, said Kitur. Another officer was stabbed in the stomach and is being treated at the hospital, he said. A reporter at the scene saw police shoot and kill one person as they tried to disperse a growing crowd, AP said. The police fired tear-gas and live rounds over the heads of taunting crowds, who hurled stones back, Reuters news agency reported. The head of a Mombasa-based rights group criticised the police action. “There was no need for excessive force and the police should have restrained themselves to avoid bloodshed,” said Khalid Hussein, executive director of Haki Africa. He said that it came the day after they asked police to avoid violence and talk to the youth.